Most avid cyclists seem to be drawn to films where bicycles play a role or even a central role. Unfortunately, though they have bicycle content, not all are well-done. Still, when the weather is simply to bad for cycling, it is nice to throw another log on the fire, slip a DVD into the player, and lean back in a comfortable chair with a hot mug of tea and watch something bicycle-related. An amazing number of these can be purchased from eBay or Amazon.com. Here's my quick list, with brief synopses. Did I miss any? Of course I did! That's why I'm looking forward to your choices/picks/recommendations for bicycle-related films. My list is just a starter. Two brothers tackle the Hell of the West through the Rockies. Thin on plot and fairly unrealistic portrayal of racing tactics, but a lightning-fast wheel change by Rae Dawn Chong is worth seeing, as well as the old US 7-Eleven team and Coors Classic footage. Kevin Costner sports a moustache in this one. Poverty-stricken Antonio needs his bicycle to do his new job. But the same day he buys it back from a pawnshop, someone steals it, prompting him to search the city in vain with his young son. Working-class cycling youth from middle-America's car-culture enters collegiate bike race for the glory and honor of the home-town crowd. Young man needs a bicycle taxi for survival, but it is stolen. A dark and depressing film set in saigon's criminal underground. Three short stories about women in modern Iran, one about a woman who wants to enter a bicycle race and her husband who is very much against it. Architect joins a bicycle racing group where a detective is member. He uses this friendship to cover the murder of his wife. Final confrontation is done using bikes, not guns. French/Belgian comedic portrayal of Ghislain Lambert, a fictional road racer and team "water carrier". French filmmaker/comedian Jacques Tati is a bike-riding postman attempting to modernize delivery service. Story of a young man struggling to find meaning in life. In th emidst of utter despair, his bicycle begin to disappear, one part at a time. In respoonse to a note, he receives one in turn offering it back a piece at a time. As he puts his bike together piece by piece, he and his life are also reassembled. CTC's current recommendation, about a fatherless young man who falls into the care of a hairdresser, his most valuable possession: A bicycle. Young career woman works for Italian fashion house -- till it closes. Making a run for it with the last company asset (a red Alfa Romeo) she collides with a bike messenger. Unable to pay the damage settlement, she works as a bike messenger. Three Nebraska three slackers start a bicycle courier service. Despite overwhelming naivete and odds, their business becomes a resounding success. Newly destitute ex-floor trader decides to become a bicycle messenger in NYC. Pee-wee Herman embarks on a nationwide search for his beloved bike after it is stolen while he was visiting his friend. Travelling author Rob Penn embarks on a world-wide search for the best hand-built parts, with which he plans to build his dream bicycle. Along the way he charts the social history of the pedal-powered conveyance, and explains why it is one of humanity's greatest inventions. A 1930's bike messenger wins the big 6-day race. A hard to find B/W film from the 40's. Lots of 6-day footage, starring era comedian, Joe E. Brown. A personal favorite of mine, 'cos I knew Freddie Schultz, who was one of the standout riders in the film, and have recordings of the tales he told me of his years as a Six-Day Rider and the making of the film. Riders in the film were supplied with premium tubular tires, handmade by Mrs. Pye in her New Jersey basement. Whenever they got a puncture, they were given new tires. Some of the riders helped the process along by secreting straight pins in their jerseys, deliberately puncturing their tires in the aftermath of frequent falls on the board track. Fred also gave me the little Motobecane U-frame Folder I restored for my father. I was proud to find and give his daughter a copy of the film, which she watched with Fred before his passing. See: http://www.6dayracing.ca/riders/schultzf/schultzf-bio.html Fred, you were a legend, and I miss you! Thinly veiled homage to cycling great Fausto Coppi; determined grandmother tries to rescue her cyclist grandson after his kidnapping at the Tour de France. A middle-aged house painter, goes through mid-life crisis and takes up cycling for exercise, meeting an attractive young bike racer. The painter thinks she is interested in him on a personal level when she really only wants to help him prepare for an age-group bike race. Engaging documentary about this ultramarathon, cross-country road race and those who participate. Follows a first year professional cycling team led by two veterans through a year on the American racing circuit. Freely-adapted true story of a man who takes his wife and five children on a 2,000 mile bicycle trip across Brazil in search of a decent job. Bicycle activist Ted White made this short (27min) film to show the superiority of the bicycle to the automobile, with scenes from all over the world; source of the term "Critical Mass" as applied to bicycle demonstrations. I'm going to stretch the topic slightly to include a short video. I think this is beautiful: Proem- When frailty fails. Oh! What a nice and welcome addition, Ian; well done! It is stunning in its simplistic beautify and purity of line and form. It is hard to believe so many Big and emotional concepts can be captured and portrayed so minimally. I think it's a great idea to include YouTube and Vimeo videos in this category, as well. This is one of my favourite racing videos. Cancellara’s Descent « An Ordinary Cyclist. This one is a beautiful piece of Tour history. Vive le tour! 1966 and all that. If you love toeclips, bar end shifters, tubs, wooly shorts, riding to the point of collapse, amphetamines or brandy you'll love this. It went by the title "Belleville Rendezvous" in the UK. A work of gently unsettling genius. Humbles a person just to see that, doesn't it? It is a real pleasure seeing an accomplished person performing at the absolute top of their game. one of my all time favourates is when steven roach chased down delgardo in the 87 tour he hit over 70mph on that decent ah if only i knew how to dig up tv footage of that 87 tour magic. It went by the title "Belleville Rendezvous" in the UK. James, thanks so much for the update on the localized title. This happens surprisingly often, and I may have missed some more. I've edited the original post with a second entry so people will be able to catch it either way. Sharp eyes and most welcome; thanks! It is possible the scene you recall is among these. It would be great to see it again. As I said, Epic! Asiemut is a great touring film made by a french canadian couple cycling across China and Tibet and down through Nepal and India. That link is to a trailer on vimeo but the full film is available on dvd. http://www.thorncycles.co.uk/forums/index.php?topic=3925.0 Lots of pause-button moments ahead to see what I can learn. Outstanding. What a find! Terrific website, too. 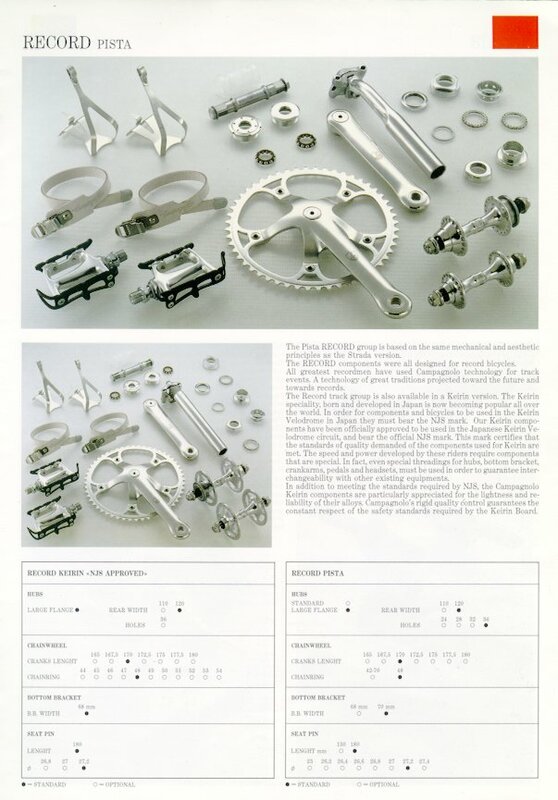 For those interested in NJS/Keirin-apprived components, they're available from a number of online vendors, including this one: http://tracksupermarket.com/ It is worth noting Campagnolo's Record Pista group didn't make the cut for Keirin, but the later Keirin Pista group did in 1991 (see: http://www.campyonly.com/images/catalogs/1991/91recordpista.jpg ). Yes it is a very well made film and the cinematography is superb in the amazing landscapes they rode through. I saw it in the local arthouse cinema when they had a tibetan themed festival showing. It was a digital projection, and looked great on the big screen.